Are you a military spouse or veteran who owns their own business? Do you have a home-based business, but have recently moved and are finding networking difficult? Do you wish to expand the client base of your existing business? 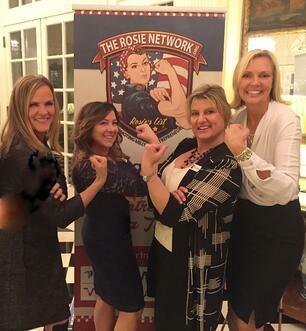 Then, meet The Rosie Network, a non-profit founded by military spouses with a mission of promoting military family-owned businesses to the public by making it easier to connect with them. The Rosie Network was founded by Stephanie Brown, Robin Elliott, and Jill Ivie after Stephanie spent hours searching Angie’s List and Craigslist for a contractor to do repair work on her home. Not comfortable having someone unknown coming into their house and preferring to hire a veteran, Stephanie set about creating a means for the American public to locate our nation’s military family-owned businesses. What is The Rosie Network? One thing that sets The Rosie Network apart from other lists is just that…it is a network, not a list. If you provide a service or have a product for sale--homemade, national brands, or anything in between--the website is there to help you promote your product and business. Best of all, The Rosie Network is completely free to use! Your Rosie Network webpage gives you a web presence without the cost of maintaining a website. You’ll get a photo gallery, content tabs, a place for testimonials, and more. This profile page is customized to suit your business needs. Your affiliation with the military will be verified through ID.me (formerly TroopID), a veteran-owned company which provides verification services to the Veterans Administration, Overstock.com, and many others. The Rosie Network only features military family-owned businesses on their Rosie's List search tool, but they don't stop there. Through a network of like-minded partners, they provide access to valuable business support and resources, on-line entrepreneurial training, mentoring, and more. All of this is done at no cost, whether it’s just the beginnings of a business idea or an established business looking to expand. Coming soon: e-commerce opportunities via a shopping cart. The Rosie Network is a non-profit organization and operates through the support of sponsors and fundraising. For more information, please visit their website.